At 6 p.m. Wednesday, students in Ladd Library’s Academic Resource Commons helped themselves to chai as they pulled out their books and opened Word docs on their laptops. The Thesis Café was open for business, its goal to support any student writing a thesis, says Bridget Fullerton, assistant director of Writing at Bates. Fullerton, who earned a doctorate in writing and rhetoric at the University of Rhode Island, works with students in the humanities, social sciences, and interdisciplinary fields, helping with everything from formatting a table of contents to checking the clarity and consistency of a thesis argument. On Wednesday, she sat with Chloe Oslin ’18 of Edmonds, Wash., who was working on her thesis on art history and criticism. Oslin’s thesis adviser, Erica Rand, the Whitehouse Professor of Art and Visual Culture, had recommended that she call on the café. Even the student tutors themselves say that the ARC’s helpful atmosphere is, well, helpful for them too. “If I have a question about something I’m writing I can go to any of the tutors that are here and even sometimes the other students,” says Claire Sickinger ’19 of Simsbury, Conn., who is a peer writing and speaking assistant as well as a peer tutor. 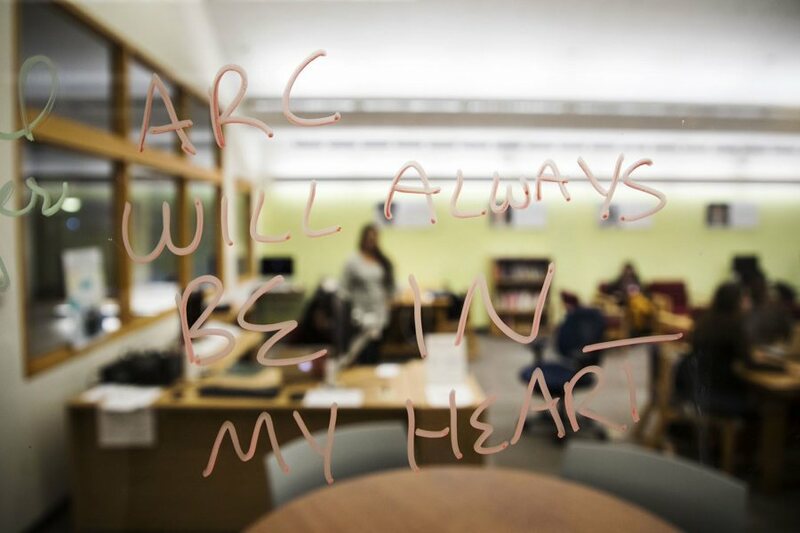 The ARC home is in Ladd Library, but it was in action across campus Wednesday night. Three separate Peer Assisted Learning sessions for students in physics, biology, and chemistry took place in Carnegie Science, Pettengill, and Hedge Halls, respectively. As the name indicates, the sessions are led by fellow students who know the material and are trained to help. “It’s a good way to get help outside of class with someone who has taken the course and knows the subject,” says biology major Natalie Givens ’20 of Fort Collins, Colo.
Givens began attending sessions last year. “My intro chemistry professor told me people who go to PAL sessions do statistically better on exams, so now I come pretty much every week,” she says.